When I first picked up this title I imagined it would pull back from the detail and micro-angle on nationalist movements cropping up around the world and draw some larger conclusions. It doesn't get that far, but it does raise the questions. Peer gives a detailed timeline of events that led to the embrace of the authoritarian leaders in India (Narenda Modi) and Turkey (Recep Tayyip Erdogan). 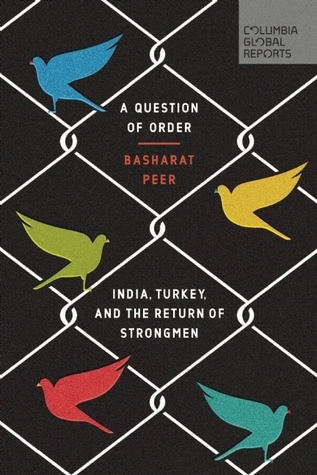 Author Bashir Peer points out that those two countries are not alone, and names Russia (Vladimir Putin), Egypt (Abdel Fatteh ed-Sisi), Hungary (Viktor Mihály Orbán), Chad (Idriss Déby) Belarus (Alexander Lukashenko), Cambodia (Hun Sen), Singapore (Lee Hsien Loong). Somewhat oddly, I thought, he pairs Aung San Su Kyi (Myanmar) and Rodrigo Duterte (The Philippines) and names them as illiberal, if not outright autocrats along with Paul Kagame’s (Rwanda) regime, all of which have silenced critical voices, and have not stood up against political and religious persecution. When you look at all those names spread out like that one does have to wonder--what's happening? What Peer does in this book is follow events that led to the rise of Modi in India, showing his aggression in the suppression of Muslim and Dalit rights. Dalits are India’s lowest caste, and many have benefitted from government attention to their plight in society. However, being admitted to university apparently doesn’t mean Dalits actually have professors willing to mentor them or recommend them or promote their work, somewhat reminiscent of oppressed classes in any society attempting to take advantage of their legal rights. Modi began his political career working for a Hindu supremacist organization. What may seem remarkable about Modi’s rise was his support from the intellectual, overseas-educated, and business elite. Not so strange when you think that “inequality in India is now growing at a faster rate than in other developing countries like China, Brazil, and Russia.” His biggest electoral challenges were traditional opposition of lower and middle castes to his party, which he managed to overcome with a robust twitter and get-out-the-vote campaign. After he won as prime minister in 2014, he talked a good game about putting caste and religious divisions away but was unable to prevent the country’s descent into violence the following year, probably because he was unwilling to act against this party. It might be worth noting some barely-there shadow outlines of a comparison forming between Modi and Trump. It is worth noting what made Modi popular, how he sustained that popularity, and how quickly taboos against hate talk and violence evaporated. In Turkey, the period of instability Peer describes starts a little earlier, in 2006. Erdogan took over in 2003 and pushed democratic reforms to make Turkey appealing to the European Union, and trying to lessen tensions with its Kurdish minority through negotiations. Healthcare, affordable housing, and infrastructure improved, but it was the loosening of the non-secularist creed, expanding collective bargaining rights, increasing welfare provisions for children, the disabled, and the elderly and allowing Muslims with headscarves into the governing body that had long banned them. Erdogan was loosening the control of the Kemalist military. The July 2016 coup attempt in Turkey is covered in great detail, and Peer discusses the Muslim preacher Muhammed Fethullah Gülen, the cleric living in Pennsylvania in the U.S. who, once an ally of Erdogan, opposed to his rapprochement with the Kurds. Gülen’s very powerful group with tentacles worldwide--and especially in the Turkish police--was supposedly responsible for the coup attempt, or was blamed for it, in any case. The detail here is rather more than I was expecting, and less at the same time. I could be interested, but somehow connecting threads were missing in this discussion and I got lost in the details. For someone seeking details, however, this is a good view. This is not a long book but I had a hard time getting a grip on this material and wished it had a greater amount of overview or boldface marking what we are meant to take away. Neither of these countries are my area of expertise, but it was difficult to pick out a few big ideas. It may be a better read for someone that already has a basic understanding of the culture and government in these two countries to take advantage of Peer’s providing the timeline of conflict for the past couple of years. One country's specific experiences are probably not going to be immediately relevant to a worldwide theory. One would have to pick and choose details and immediately then one's conclusions become suspect. Authoritarian regimes are nothing new. The author needs to remind us why this moment is different.